Doris Shepherdson, 81, passed away Monday, July 28, in Modesto, Calif. She was Head Resident Counselor of Hardy Hall at Huntington University 1975-1979. She was also the aunt of UB endorsed missionary Dave Spencer. Doris was a member of the former Oakdale United Brethren church in California. Godspell will be performing their final show at Huntington University, in the Merillat Centre for the Arts, on August 8 at 7:00 pm. This show concludes the summer tour of 44 venues and nine states, including churches, church camps, high schools, a community festival and a performing arts center. This year’s program captures an island theme – Survivor meets Cast Away. With references from classics such as Fantasy Island, Hawaii 5-0, Gilligan’s Island, and Tarzan to the more familiar Survivor, Lost, Cast Away and The Amazing Race, achieves another fresh take on the Gospel of Matthew that will entertain, inspire and transform! Admission is free, and a reception will be held in the lobby afterwards. This five-minute video tells about the Worship Leadership Program at Huntington University. The program is now in its third year. Two weeks ago we brought down the curtain on another challenging, but successful year. We were blessed with a very beautiful graduation service. Our special guest speaker was Rev Dr Stephen Clark, son of Mr Ernest Clark, one of the three founding fathers of the College in 1945. Dr Clark gave a very inspiring and challenge address to the hundreds of persons in attendance. We had the first group of 5 students graduating with a B.A in Theology with minor in Business. 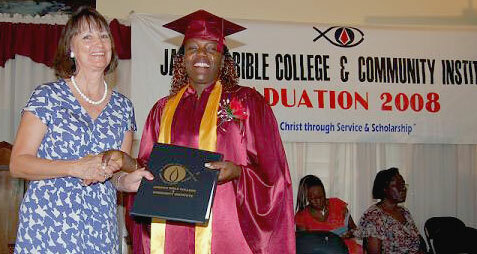 Several students graduated with the Certificate in Business, & General studies. 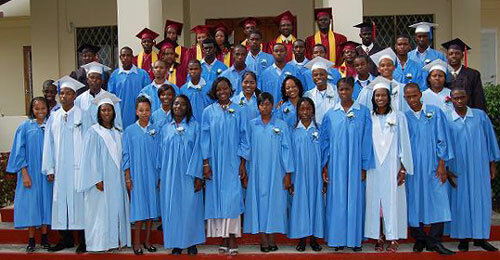 Some students completed their Seconday level education under the ROSE II/ Ministry of Education program. In all there were 59 students. Lenique Powell, a Secondary level student who committed his life to the Lord in the Week-end Camp in February, has expressed a desire to return to study Theology. We are putting things in place to offer him a tuition Scholarship. Duane Harris, another student who just completed his Assoc degree in Business, wants to do the BA in Theology. Pray for Scholarship support. BA in Theology, minor in couseling. BA in Psychology emphasis on counseling. Early Childhood Certificate through the HEART NCTVET. Our desire is to lift the standard of the College and increase and improve the offerings. Pray with us for a good group of incoming students for September 2008, the necessary committed teaching/Administrative staff, and the necessary funding. The challenge to change the name of the Institution to reflect the original vision and purpose, and broaden its appeal for funding, and student enrollment. Many people have fond memories of attending summer camp while they were growing up. Friendships were formed, knees were skinned, challenges were conquered, and most of all, life long lessons were learned. Now that we are older, we are glad places like that still exist for our own kids and grandkids. Camp Cotubic is one such place. It held a special place in the heart of Mr. Tom Ponsot, who passed away in the Spring of 2005. Tom saw the great potential of Camp Cotubic and volunteered his time and financial resources to preserve it as a place where his own grandkids and many other children could experience summer camp. Tom served as the chairman of the camp board for several years and was passionate about the camp’s ministry. Location: Clear Creek Golf Course, Huntington, Ind. Cost: $50 per person (includes green fees, cart, snacks, and lunch). The tournament will use a four-person/team Florida scramble format. Prizes will also be awarded in a variety of categories. All proceeds to go to support the ministries of Camp Cotubic. To register, please contact Zanesville United Brethren church by email or phone (260-638-4220). For more information about Camp Cotubic, please visit the Camp Cotubic website. I love books. I keep a lot of books at home, and I’ve given away a lot of books. Someone told me that a person who can read but doesn’t is no better off than a person who can’t read at all. Books can open up your mind and vista. You can do things by reading a book, be translated to somewhere else. That’s the magic of books. Christian men are notoriously bad about not reading. At Scripture Press, when we produced a book for men, we had to use a cover with a soft design that would attract a woman, who would then buy it for a man. Women, we knew, buy more books than men, even books for men. At Mainstreet, I was always after people to read. I gave the elders books to read, theology books. There are so many good Christian books. A group of 35 people from New Hope Community Church (Bryan, Ohio) are finishing up a short-term trip in Honduras. Polly Dunten underwent surgery Monday morning to remove a brain tumor. Her husband Darwin, pastor of First UB in Findlay, Ohio, sent me this report this morning. The surgery is over and the Lord answered our prayers. The surgeon feels he got all of the tumor either through surgery or by burning it out. There is nerve damage and we will see to what extent in the next few days. She currently has numbness on her left side, However, I saw the most beautiful almost smile I ever saw this evening before I left her. The tumor was pressing hard on the brain stem. It also “thinned” the nerve. Similar to an electric wire that looses its insulation. Thank you so much for praying for us. God is good and I am so thankful He allowed me to have my wife for a little longer. We heard from people from around the world and around the United States. We are humbled. I have written a more indepth statement on Polly’s blog. It’s all part of the journey through the discipleship pipeline. So they’d come to church with someone on their arm, and would walk with them through the process. Spiritual maturity is not measured by what you know, but by who is on your arm and heart on Sunday. If you don’t have someone on your arm and heart, don’t talk to me about your maturity. Polly Dunten’s surgery to remove a brain tumor will be Monday morning, July 28, at 7:15. It should take 4-5 hours, and she’ll be hospitalized probably until Thursday. There is a lot more information on Polly’s blog in a post earlier today. Perhaps your church could remember this ministerial couple in prayer on Sunday.